It's not difficult to tame and train a calf if you have the time to do it. Remember calves grow up to be much larger cattle -- they may still be your pets, but they'll be large enough to ride or pull a wagon. Unless you have unlimited time and acreage, it's best to have just one calf as a pet. Grown cattle eat 3 percent of their body weight each day. Male calves grow up to be bulls, so if you get one before it is castrated, that’s your first order of business -- only experienced cattle breeders should have bulls, as they are dangerous and they destroy property. 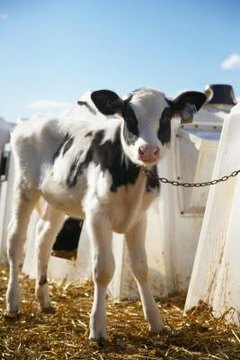 Male calves can be castrated within days after birth, usually when they get their mother’s supply of colostrum, so it’s unlikely you -- or your vet -- will be doing it too early. Female calves are called heifers at approximately 6 to 10 months or when they are weaned; after they have their first calf they are routinely called cows. Handle your calves as much as possible as soon as you get them. Ideally, you will be getting calves that have already been tamed and handled. If you are getting “bucket calves,” those that have left their moms early and need bottle-feeding, you will be handling them at least twice a day to feed them mother’s milk replacer. Take advantage of this time to rub them with your hands, stroking their sides, belly and legs. Put a halter on your calves after they are 2 months old. When they adjust to that, attach a lead rope to practice leading and tying. Your fencing is an important consideration for calves. Even if they are free to wander in your yard, you don't want them on a road or at your neighbor's house. A newborn calf can weigh close to 100 pounds and at maturity will be 10 times that. Fencing must be sturdy; an electric wire adds extra insurance. A barn is ideal for cold weather, but a simple shelter to protect from harsh weather is sufficient. Calves and cows need plenty of clean water. Plentiful pasture grass makes feeding easy, otherwise you'll need hay year-round instead of just in winter months. You may think of your calves as nice pets to have around, but look at ways to use them as they grow older and stronger. If you have a dairy breed, you have a source for fresh milk daily -- which you can turn into buttermilk and butter. Cows can pull wagons and carts. You can ride them. Ensure you have contact information for a cattle-savvy veterinarian to give necessary vaccines. Cows attract flies, so to prevent the transmission of contagious infections like pinkeye, and to keep your neighbors happy, proper fly control and pasture cleanliness are important.